By Michael Tobis and Irene Tobis This article appeared on Grist several years ago. It’s still visible on the Grist site but with the byline removed. Irene and I wrote it. It’s as interesting a concept as ever. Imagine, as a thought experiment, that everyone on the planet had the same share of the world’s resources. It turns out your share is about six acres (2.5 hectares) of dry land. Now imagine if that were your whole world. How would you treat it? It’s difficult to think in extremely large numbers. Suppose, for instance, the U.S. government spends around $100 million on climate models per year. (I believe this is about right.) That sounds like a big number! Much too big, perhaps? Well, if you are an average American, it’s 33 cents out of your pocket every year. Is that a good deal? Too much? Too little? The pentagon spends $450 billion per year. Is that a lot? That’s about $1,500 per American. Expressing numbers in per-capita terms puts them into perspective. I have been thinking about this in the context of the big question of our time, which as Jeffrey Sachs points out, is not about terrorism or islamo-fascism or even oil or climate. It is about whether all of us can fit comfortably on this planet. It is a big population and a big planet, so thinking quantitatively is daunting. Fortunately, per-capita thinking can put matters into a more familiar perspective, make them more palpable and less mathematical. Consider the world of The Little Prince by Antoine de St. Exupery. The Little Prince of the story is a child living alone on a small spherical asteroid, his only companion a single flower. He consoles himself by the fact that it is always a short walk to a sunrise or a sunset. Let’s tell a slightly different story, with a similar asteroid, a per-capita world. Instead of being one of six billion people on a big planet, let’s suppose you were alone on a comparable asteroid. We’ll give you your six-billionth share of the surface area, your six-billionth share of each of the major landmasses and biomes, your own six-billionth scale Africa, your own little Australia. In other words, you will have exactly the average resource ownership of everyone else on earth. Your little asteroid has a six-billionth of the earth’s total surface area. It is a sphere with a radius of 82 meters, and with a surface area of about 85,000 square meters. That, depending on how you prefer to think about it, is almost exactly 21 acres, or 8.5 hectares. In more urban terms, that is 19 American football fields, or about 12 English football (professional soccer) fields. Just over 70 percent of your 21 acres is covered by salt water. If it were to freeze over, you could walk from any point to any other point at a leisurely pace in under ten minutes. Since the ocean covers fifteen acres, the land surface covers the remaining six acres. A vast variety of soils and climates are arrayed about your 6 dry acres. According to the CIA, the area under cultivation is a bit under 5 percent of the total land area, or a bit over a third of an acre. If you push matters to less valuable soil, you might be able to grow things on as much as an acre, but most of your 6 acres are desert or tundra. You even have some substantial ice sheets on your land. There is also the problem that you have built your house, your workshop, your garage, your driveway and many of your industrial outbuildings on the best farmland. About a third of your land under cultivation is irrigated, much of it using depletable groundwater. Some of the groundwater is being contaminated by some of your industrial processes. To a lesser extent, your soils are also being contaminated, but a bigger problem is that as you till them for food they erode much faster than the natural rate of replenishment. Still, you live much better than your great-grandparents, because you have found ways to dig up fossil fuels and use them to power heavy machinery to do your bidding. Some of your machines are quite advanced, but some of them are crude and nasty. All your raw materials are dug out of the ground and refined. You produce a fair amount of industrial waste along with household waste, but you do not attend to it very carefully. You currently use a bit over a ton of fuel per year, producing 4 tons of CO2. (This is based on world average; note that the typical North American emits about five times this much!) It seems from direct measurement that about half of this (two tons per year) stays in the atmosphere, with the rest ending up in the ocean and the soil. While this is a fairly small fraction of your atmosphere’s total mass of 880,000 tons, you are wondering whether this has anything to do with a certain slushiness you are starting to see in your ice sheets. Your little world is a model of the sustainability problem. In some ways it is a fantasy, but the scales and constraints are real, expressed not as huge global numbers but as per capita quantities. You are using fuels that are not replaceable. We can come up with some numbers for groundwater reserves and fuel reserves on the same basis. 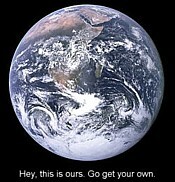 Your world is smaller than your ancestors’; your use of resources is more intensive and accelerating. There is no replacing your six acres, no frontier. No amount of human ingenuity will make your world’s surface bigger. Is your little world big enough to sustain you indefinitely? Are you past the point of permanent damage from which no amount of future cleverness can recover? You may be considering resolving your problems by increasing energy intensiveness. Indeed, some of these problems can be solved with more power. You can desalinate sea water, for instance. However, more energy use puts demands on other parts of the system, causing other problems. Increasing wealth won’t make your asteroid any bigger; indeed, it seems only to create more byproducts you have to put somewhere. Meanwhile, the little asteroid keeps shrinking (representing your declining average share of the land as the real world’s population increases). Whether by design or by circumstance, sooner or later you will run up against limits. It is hard to argue that you can avoid big changes forever, all the while becoming wealthier. As you contemplate your little asteroid, keep in mind that the intensiveness described there is a worldwide average, including many poor people who have much smaller impact than almost everyone who will read this. Most of the world’s population aspires to at least a European standard of living. Economics only complicates matters and seems to be a constant distraction from the baseline question: can we continue to provide, indefinitely? The fact that the planet is finite can’t be treated as a minor factor in this crucial question: how well can we sustain ourselves, meaning a modern society of six to ten billion people? Optimists argue that progress will prevail. Pessimists argue that progress is an illusion. I think progress is possible, but not automatic. When I contemplate my asteroid, I suspect I can manage, but I don’t think I can afford overconfidence. I think we can prevail, but we will have to be clever about how we do it, and can’t rely entirely on individuals acting from self-interest without careful collective attention to how we set up the reward structure. But it helps to consider what we would do with our share if we didn’t have to negotiate with anyone else. right, but that's hardly the point, is it? Everyone gets two major league baseball fields to live on (give or take some warning track)... but you have to live inside the base lines. From the base paths to the outfield grass is covered in solar panels. The outfields and foul territory are all mountains, deserts, national parks, etc. I was surprised how little agricultural land is technically necessary to support me (but as an omnivorous American I know that I'm claiming far more than the minimum). Of course variety and other luxuries go right out the window. The problem with this model, in my opinion, is that it fuels the back to the land types by making a certain kind of pastoral future look more appealing than it really is. If everything is just an inconsequentially short walk away, you don't have to worry about transporting anything (including yourself). Of course I build my house deep in left field to free up farmland, but in reality I can't very well commute to work from the Sahara. If the ocean is never more than 50' away, I can keep all my crops irrigated (whats a few more panels in my massive solar array?). A good sized cistern on my plot scales up to be a massive reservoir. I think I can do a pretty good job of stewarding my half acre or so of farmland to keep it from blowing away, but in reality I need to be tending several other people's half acre as well. How many other people's land do I need to work? 5? 50? 100? A worthwhile thought experiment though. "the reason we are social animals", Mr. Fuller? Do you think that genus Homo evolved sociality so it could invent agriculture? Do you have a teleological view of evolution? Economies of scale. Absolute and comparative advantage. Transitionistas also like economies of scale, though they don't call it that: they're of the Jacobs externalities sort (more economies of diversity, but they rely on the density supplied by cities and towns). I'd say you can't fully explain why e.g. everyone in the US crams into 2% of the landmass without some economic ideas including those I just listed. Not saying they're the only thing that explain settlements but they're a vital part of understanding how we're so productive and why everyone doesn't just tend their own plot ("backyard capitalism"). Thinking about individual footprint - yes, very useful. But I'm not sure economics just complicates matters. There are some essential ideas there that help explain how we can manage to be so productive given the finite resources we have. The point about "complication" is not that central decision making is better than a market system. In many ways it can't be. The point is that in the end money doesn't enter into it. As far as the physical and biological world is concerned, there are people, tecnologies, behaviors, and so on, but money really doesn't figure into it directly. The asteroid model abstracts transactions out and just leaves aggregate behavior. Soo, if the top floor is split between garden and solar panels, the second floor is bedroom, playroom, gym and movie room, the ground floor is formal welcoming spaces and dining and kitchen, basement one is food storage, ice bins, power plant, fuel, second basement is bicycle and tool shed, heck, I might not even need my entire allotment. Did St Exupery envision real estate salesmen for il piccolo principe? My dream house would be a mud hut with an open fire in the middle. An open fire is technically and aesthetically super-superior to all modern electric or gas fuelled ovens. You just need the right pots (they cost a plane ticket to India plus a few Rupees). Alas I'm not sure my little planet would grow enough wood. P.S. : The open fire could even be operated as a carbon sequestration machine: Throw embers in water to get activated char, use it in the compost toilet, voila: Terra Preta. Way too simple to believe. It'll take more Earths to pull us all through. PS: As long as we Americans get our fair share ( 1 Earth ), everyone else is free to divide up the remainder as they see fit. This article mentions how some of the impacts of resource scarcity can be overcome by increased access to energy by for example desalinating water and recycling metals. The incredible energy availability from Nuclear Power becomes apparent using this article's premise. Your little slice of earth contains 600 Kg of Uranium in its ocean water and 20,000 tonnes of Thorium in its crust. Your lifetime energy needs can be met with approximately 200 grams of this nuclear material. This is a golf ball sized piece of metal. Using the latest reactors, the waste will occupy a volume of 1 soft drink can and will need to be stored for 500 years. This is an essentially infinite supply of energy. That might be true of a 3D pie-slice whose pointy end is where the Earth's centre used to be, with the other end being a bit of spherical surface inherited from the Earth. But Tobis has specified an 82-m radius sphere, a much smaller mass of rock. Rather than vertically extending the boundaries of an 8.5-hectare property down to their convergence point at Earth's centre, he has in effect extended them down only 27 metres. If his sphere is made of continental upper crust, 7 ppm Th, it contains 40 tonnes of it, and 15 tonnes of uranium. Of the latter, that's actually plenty for a minimum reactor, without enrichment of the fuel . The model is focused on surface area. It breaks down physically on questions of mineral resources or other matters that involve digging. The best way to rescue the intent is to think in terms of per capita resources.